Joel Segura, joined by his attorney, held a news conference Friday afternoon, firing back at the city for accusing the board of aldermen candidate of running for office in Edcouch while living in Elsa, but said that, for now, he doesn’t plan to file a lawsuit. Edcouch elections administrator Pete De La Garza sent Segura, one of two candidates for board of aldermen Place 2, a letter accusing him of either illegally voting or committing perjury by submitting a ballot application with an address in Edcouch. The city requires candidates for its board of aldermen live within city limits. “This is certainly politically motivated,” said Orlando Jimenez, standing next to Segura, who seeks to unseat current alderwoman Esmeralda Cabrera. The letter, sent two months after Segura filed to run for alderman, was sent by De La Garza on Oct. 1, more than a month after he filed for office. Jimenez questioned the timing of the letter, sent three weeks before the start of the early voting period. 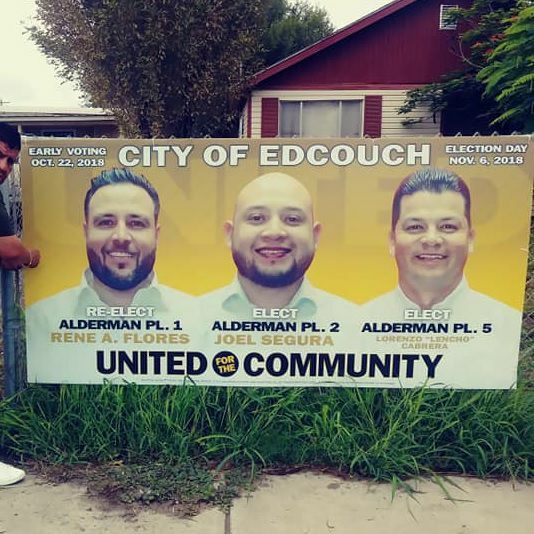 “What is very, very interesting is that the (interim) city manager of the city of Edcouch, he himself is running for a position,” Jimenez said, referring to interim City Manager Eddy Gonzalez. Gonzalez, while overseeing city administration, is running a campaign against current alderman Rene Flores. Flores, Segura and Lorenzo “Lencho” Cabrera are running together on the “United for the Community” slate. Segura listed 108 N. Fredrick St. on the ballot application, a home he lives at with his aunt, Jimenez said. “It’s all baloney,” Segura said. Hidalgo County Appraisal District records show Edcouch collects city property taxes on the home, owned by Alicia and Rosendo Peña. Jimenez clarified that Rosendo Peña died. The dispute between the two may head to court for a resolution, if voters elect Segura. His name remains on the ballot. “All I want is a chance to help my city, and to help the people of the city,” Segura said.